How to Put on a Dog Harness...Even if your Dog is Wriggly! 6 Best Dog Crates for Comfort, Function, and Style. / 6 Best Dog Crates for Comfort, Function, and Style. All medical claims reviewed by Dr Pippa Elliott. BVMS, MRCVS. When you’re out you want to know the dog is safe – Right? Whether you’re a pet parent to a new puppy or an adult dog, consider the advantages of using a dog crate. Of course, you want the dog to be safe.. Well, a crate provides physical safety, in that it prevents them things they shouldn’t (such as electrical cables!). But more than that, it provides emotional security. If you're in a hurry, check out the top rated Best Dog Crates for Comfort, Function, and Style. At a basic price. A great entry price product but not a thing of beauty. When crate trained with empathy (see Doggy Dream Teams top guide to Crate Training) it becomes the pup’s den, their safe place to be. It gives the pup a way to snuggle down in seclusion when the world gets too busy and they feel overwhelmed. But even when you’re sold on the idea of puppy crate training, sometimes the physical appearance of a crate in your sitting room can be off-putting. Which is why in this review of the best dog crates we balance aesthetics and price against function. This is a great option that doubles up as a crate and a carrier. An added bonus is the super-low price point. Offers the flexibility of a pop up crate for those who don't want a crate as a permanent fixture. 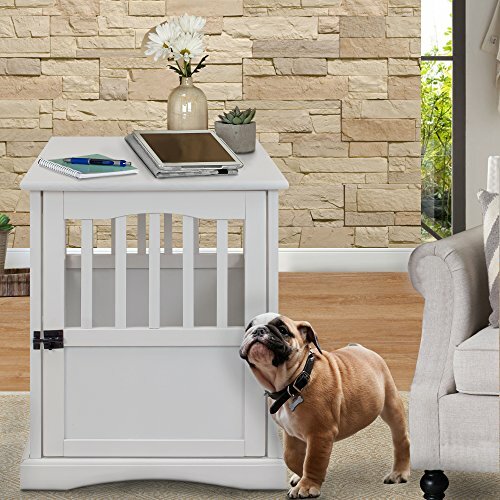 A dog crate that looks like regular furniture...at a fraction of the price of competitors products. A great compromise between security and good looks. The wooden outer shell covers a traditional metal crate, making it safe for chewers and strong dogs alike. Let’s get this puppy school off to a start with a basic product for reference. This no-nonsense dog crate comes in seven sizes, suitable for the tiniest teacup pup to a generous sized Labrador. Whilst roomy enough for a larger dog, the limiting factor becomes whether it is sturdy enough to hold a dog determined to get out. For smaller pet pals this stainless steel construction is plenty strong enough, especially when you fur-friend looks on it as their den. The design includes handy features such as it being fully collapsible, making it possible to collapse it down and take it on your travels or fold flat for storage. There are doors on both the long and the short sides, and an inner tray to make cleaning a breeze. This Amazon Basics dog crate stands close examination because it is extraordinarily good value. Whilst it scores highly for function, it’s clearly not a beautiful object and will be an eyesore in a sophisticated living room. However, the design does come to its rescue with the double door arrangement. This means the crate can be fitted between existing furniture, and whichever way you orientate the crate there’s access via a door. Thus, although the front of the crate is visible, the sides and back are concealed. Did we mention it’s basically a cage…not the most aesthetically please object in the world. For the first time puppy owner, this crate offers an inexpensive way to work out if it’s for them or not. Should it not work out, you gave it a fair trial but without spending a fortune. For a small puppy or a toy dog, consider this pet carrier as an ideal dog crate. 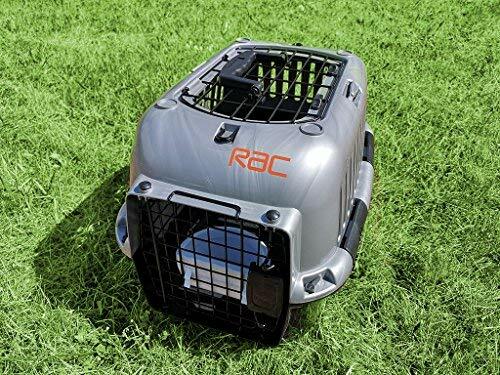 Designed as a pet carrier, it’s sturdy construction, easy-clean-design, and size make it ideal as a small dog crate. This has the advantage that the pup’s den goes with them when travelling, plus it keeps them safe on a car journey. The carrier is made from tough durable plastic, which is easy to clean. It comes in two parts which are joined by quick release tabs. This makes it a cinch to take the top off (for a comfy bed) or back on to form a crate. It has two doors: A top opening one plus a spring-loaded front opening door. There’s also a sturdy carry handle to make it easier to move. With the name of the motoring giant, the RAC behind it, you’re buying into a reputation for reliability and quality. Only suitable for small dogs. Check your dog is able to stand up and lie stretched out. If not, this is too small for them. Some products were delivered cracked or with missing clips. To avoid mishaps order well ahead, so that any faulty products can be returned for a replacement. 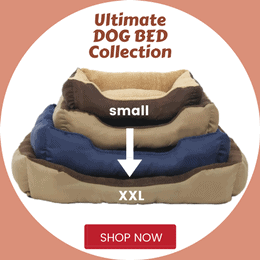 The amazing price makes this a no-risk purchase for the owner of a small dog or puppy. 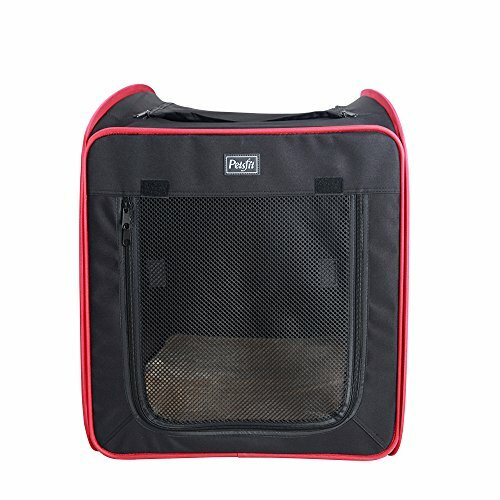 If you like the idea of a mobile crate but your dog is too big for a carrier, this Petsfit Pop Up is a great option. 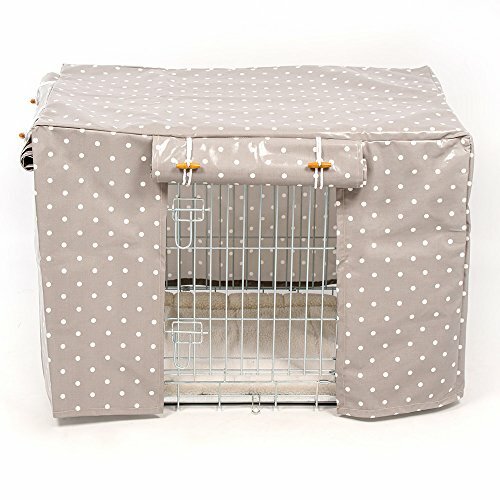 This dog crate soft works a bit like a child’s pop up tent and folds completely flat for storage. When the velcro strap is released the crate reforms in seconds. The sides are made from durable polyester and is available in black, beige, or charcoal grey. There are two side ‘doors’ made from mesh (great for ventilation) which zip closed. The price includes a free fleece mat. Large: For pets up to 25kg. This isn’t a cheap product, but it is well made and surprisingly robust for a fabric product. The quality materials also mean it is durable and will withstand normal wear and tear with ease. Of course, the biggest argument against this pop-up kennel is if the dog chews it, and isn’t the best choice for chewers. There are a few downsides to this product. Sadly, it lacks handles which some people found a problem when moving it. Also, the top has a flap which is held in place by velcro. Some escape-artist-pets soon discover this is an easy way out. Not for chewers! 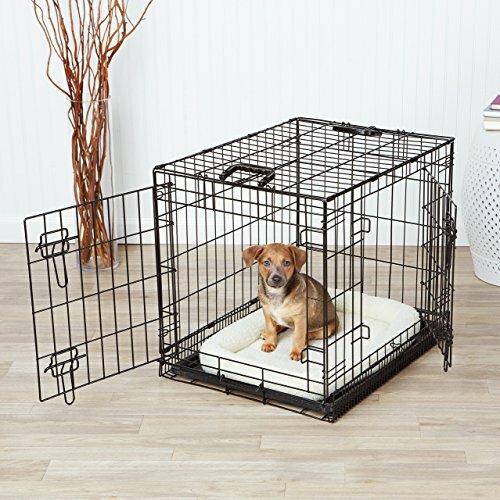 An interesting option for well-behaved dogs as it makes a good crate / bed combo. Maybe you want the benefits of crate training, but don’t want a steel cage dominating the room. The answer could be this stylish piece of wooden furniture that just happens to be a dog crate. Made by Casual Home, this wooden dog crate is just that. There’s no inner metal cage. This makes it appealing aesthetically as it fits nicely into a living room without looking out of place. This dog crate is available in four finishes: White, grey, black, or espresso. Half the walls are solid, with the upper half as vertical struts. This gives the dog an extra feeling of security, as they’re protected on all side when asleep, but also gives great ventilation. The top is solid and able to bear weights up to 120lb, making it a useful table top. The side opening door is secured with a lockable latch, for extra security. This allows you to use the crate as an end table or slide it between two pieces of furniture, and still have good access to the dog. Cozy, cute, and blends in well to a stylish room. A great canine sanctuary that isn’t an eye-sore for the pet parent. Larger dogs or dogs that are dedicated chewers, can make a meal of the wooden construction. Some pet parents told us how their dogs busted out or just plain chewed their way through the bars. Another minor gripe is that this unit is self assembly. It does take time and a modicum of DIY proficiency to assemble it. However, with due care it does build together into a pleasingly solid unit. The Casual Home pet crate is best suited to With this in mind the Casual Home is best suited to smaller dogs or those less likely to chew. It is an attractive piece in its own right and nicely camouflages having a dog crate in the front room. This product is also a great price point, compared to similar items from rival manufacturers. An alternative to a fully wooden dog crate is this clever Zoovilla offering. It consists of a traditional steel dog crate (and the security this offers) encased in an attractive wooden cover. Talk about a compromise: It blends the safety of a regular crate with the aesthetics of a wooden one. The Zoovilla dog crate is available, in small medium, and large to accommodate most sizes of dog. It’s available in white or dark wood colourways. The clever design means there’s a removable skirt along the width of the crate, which allows you to remove the waterproof tray inside. This product is self assembly but classed as ‘easy’, as the parts push together. Once constructed, the solid top makes it useful as an attractive table. Functional yet fabulous! A great blend of a practical steel crate and a piece of wooden furniture. A good compromise if your dogs may chew their way out of an entirely wooden construction but you want some easier on the eye than a steel dog crate. It’s also available in larger sizes than similar crates. The price makes this a considered purchase. Also, the removable tray requires good access to the side opening. This means ensuring the door opens onto a wide, clear space, rather than abutting another piece of furniture. A good compromise for dogs that chew or larger canines, where you want to disguise the presence of a dog crate. When you’re looking for an attractive dog crate, why reinvent the wheel? Sometimes a little lateral thinking is all that’s required. This is why this Lords and Labradors product has earned a place in our best dog crates review…even though it’s not strictly speaking a crate. OK, this is a crate cover, which, when draped over your existing metal crate transforms it into a canine four-poster bed look-alike. It’s a simple enough idea. An oilcloth cover that drapes over the outside of a metal crate. The sides can either be dropped down like curtains for a feeling of comfort and security, or rolled up and secured in the ‘up’ position with toggles. It also comes with a coordinating mattress to complete the luxurious look. Transforms a crate into a bedroom. What’s not to like! Oh, and did we mention it’s wipe clean? 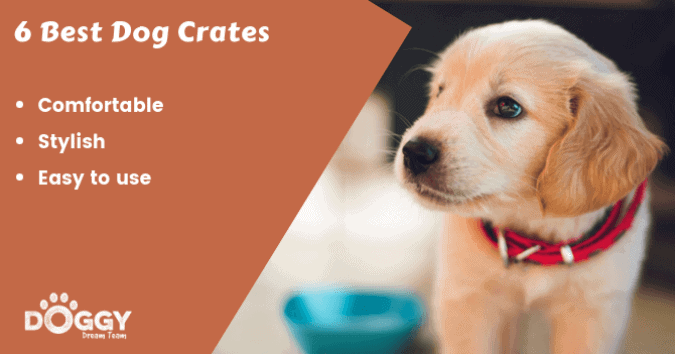 Take care measuring your existing crate and matching the size of the product. Get it wrong and the cover may swamp the crate or else not fit over properly. Not a good look! If you’re satisfied with your existing dog crate but wish it looked more appealing, then this Lords and Labradors crate cover is the simple solution. Dog crates are a great aid for basic dog training. They provide your pooch with a den and a safe place to call their own. But here’s a thing. You don’t have to settle for a purely functional crate. There are great options out there for dog crates soft, collapsible, or even disguised as furniture. And if you already have a crate that works well but looks ugly, then go for the dog crate cover hack. There’s a product for everyone, two or four-legged, to wag about! How to Put on a Dog Harness…Even if your Dog is Wriggly! Doggy Dream Team © is a participant in the Amazon Services LLC Associates Program , an affiliate advertising program designed to provide a means for sites to earn advertising fees by advertising and linking to Amazon.com. Additionally, Doggy Dream Team © participates in various other affiliate programs, and we sometimes get a commission through purchases made through our links. This revenue goes towards keeping this site active as well as other community and personal activities.